A fast-paced, cooperative, dungeon-crawl boardgame set in the old west, mixed with unspeakable horror! Funded via a Kickstarter campaign that raised over 1.3 million dollars back in November 2013, Shadows of Brimstone is an extremely ambitious release for Flying Frog, in terms of production if not in game design. The usual elements are here—dice rolling for movement, basic combat, lots and lots of thematic cards—so don’t expect anything new in that department. What we do have here is lots of STUFF, crammed into a couple of big, big boxes. Yes, a couple: there are two ‘core sets’: City of Ancients and Swamps of Death. It’s a strange decision because a lot of content is repeated in both sets. In the game, wild west heroes descend into mines to battle weird beasties, and eventually discover gates that lead to other words: in one core set, an abandoned alien city, in the other, a monster-ridden swamp world. While the mine components do have some differences, it would have seemed a better idea to release one core set and then separate, smaller world expansions; especially since FF don’t supply any instructions for combining the core sets. 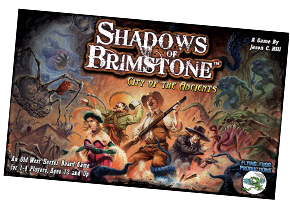 Fighting monsters and gathering loot in Shadows of Brimstone is strongly redolent of old school D&D gaming, an impression reinforced by the numerous charts on which you roll random results when you visit the town between adventures. Players cooperate against an extremely basic monster AI that pretty much reduces everything to dice rolls. But despite the lack of tactical choices, this is fun in the same way those old school games were fun: basic monster bashing, huge swings of luck, and gathering experience points to level up. Thankfully (in my opinion), FF have stepped away from the photographic style of most of their previous games and hired some excellent artists to visualise this wild-west-meets-pulp-otherworldly-horror, and it makes a huge difference to the game. The artwork is top notch throughout and brings the theme vividly to life. Unfortunately the same can’t be said of the plastic miniatures, which are at the low end of boardgame quality. Supplied on sprues, some of the figures require gobs of green stuff to cover the joins, and the detail on a few of my miniatures was virtually nonexistent. They’re fine for boardgames I suppose, but FF need to work harder to meet the standard of figures in games like Descent, for example. On a last critical note, FF continue the unfortunate habit of Capitalizing Virtually Everything in Their Rulebooks. Shadows of Brimstone is already polarising gamers: some love the basic dice-rolling, Heroquest-like beer-and-pretzels fun, and some are disappointed by the basic game design and lack of meaningful choices. But we shouldn’t be surprised at the latter, since this is a Flying Frog game after all, and these are the kind of games they love to make. This one really is all about the theme. It will be interesting to see where this game goes with future expansions (there’s already a lot more content on the way for Kickstarter backers), but it’s a good bet they’ll just keep throwing more monsters, more heroes, and definitely lots of more cards at it—and given the fact that gates in the mines can lead anywhere in the universe, the universe is the limit for your wild west heroes! Thanks! A very nice summary, and with the amount of rules in this game it’s nice to have a few of these handy. Do you plan on designing character sheets? Cheers. I don’t really think it’s worth me doing character shets, as there’s already some very nice ones available. Thanks for the tip. You should give the sheets a try and see what you think, while nice they do have some usability issues when it comes to tracking XP/gold and items with lots of text. Still trying to figure out how to fit all the minis and the Kickstarter duplicates in the boxes, so if you do a foamcore insert I´d love to see some pictures of your take on it. I’ll try them out, if I think I can improve upon them, I’ll make my own. I’m waiting on designing a foamcore insert until all the remaining Kickstarter stuff comes through. There’s a mistake on one page that mentions D36. Maybe should be 3D6? I will design a foamcore insert for this eventually, but I’m waiting until I get all the Kickstarter extras – otherwise I may find I can’t the extra stuff in the boxes! Would also love to see foamcore-plans for both the base sets combined. I may attempt to tackle this project. Some of us did not back the kickstarter, but have both sets. The only issue may be the tiles. Cards, bits, and minis may be fairly simple. But the tiles may cause a stink. Ill keep up on this…just in case anyone has something done already, or in the works. Has anyone got hold of Frontier Town yet? Looks good in video and now available for sale in UK. Thinking about buying it. No, as one of the people who gave them the money to create all this, I’m last in the queue behind retail stores and the people they convinced to pay extra shipping to get their stuff ‘early’. It is annoying to back something and get it last. Brimstone was really bad for that. Wave 1.5!!!! Any news on Wave 2? It’ll be ages yet I believe. A poorly handled Kickstarter all round, and a pretty clunky game too, I have to say. Despite all that, there are folks who seem to enjoy the game for what it is. But most do admit the game mechanics are pretty basic and what draws them is the whole “leveling up” as pect of going back to the town. Frontier Town arrived today. More figures to paint, bandits. Map board is very nice and six town adventures (although admittedly some very short). New stuff for saddle bag will be useful. Not read all rules yet, but looks interesting. I was really on the fence about buying this. I love FFGs games, but the Kickstarter for this coincided with Cthulhu Wars which I had already backed heavily and I just didn’t have the money to spin around. Hearing of the poor quality of the miniatures was disappointing as the LNoE and AToE minis are first rate. I’d love to hear if things have improved with later product releases, and how the game scales for solo play. I’d love to tell you, but due to way this Kickstarter was run, I have yet to see any later releases beyond the two core sets, despite the fact that many of them are already available at retail. And it looks like it will be a while yet. I don’t think you’re missing much frankly. I’ve only played once, but it’s a pretty bog-standard dungeoncrawler with shoddy miniatures and a basic ruleset. Yes, there are oodles of random dice tables, but so far it seems to me the emphasis for this entire game universe has been on quantity, not quality. And Flying Frog’s reputation among gamers has possibly been seriously damaged by the whole thing. I don’t know why they threw all their eggs into this one basket – perhaps they just got carried away with the theme. I think I spent more time painting and foam-coring than playing this game which is a shame, as the setting has potential. Sadly, that’s true of Flying Frog in general. Fortune and Glory which has loads of stuff in the box and is a fun Indiana Jones style game, but it takes too long to play (and set up) to get it to the table often. A Touch Of Evil is another interesting setting, but the time required to play (and set up again) means it doesn’t get much play either. Those two, along with Shadows of Brimstone are crying out for home-brew rules to make interesting setting into compulsive game (with an ideally shorter play time). Just spotted the ‘solo’ question. I have played a few games solo and found that it’s quite harsh running two characters, but more survivable with three or four. Don’t know if it interests anyone, but Flying Frog have just launched a kickstarter for an oriental version of Shadows of Brimstone. I’m not likely to buy, but it’s close to a quarter million already. I bought Shadows at retail and last I heard the backers were still waiting for delivery of stuff that was available to buy. Is that still the case? Wow! They’re giving themselves time for Oriental Shadows… delivery March 2018!!!! Given the previous kickstarter is still being delivered (early next year apparently) I reckon later 2018 is more likely. Unbelievable. The first Kickstarter campaign hasn’t been delivered yet, the minis werereally poor an the rules rough, and they’ve still managed to raise $620K+ for yet another version of this pretty damn clunky game. Wonders will never cease. Not to wish this horror on you, but any plans to expand this to cover the extra rules from all the other world and misc. other expansions with added rules? I think the only rational answer to that is NO, but if anyone can untangle the labyrinth of rules scattered among various rule books it is surely you (seriously, who write a rule book and decides to direct you to other rule books in turn directing you to yet other rule books). That’s right, I forgot about that. I actually email them about it years ago when I was looking for the expansion rules for Last Night on Earth (I had lost one of the books). They said they did not offer the rules online because it was part of the I.P. or something along those lines. I remember thinking that was freaking nuts. They are seriously more worried that people will make their own pieces and play the expansions without paying them that they would make it extra difficult for people who actually bought the game to learn it. I think it’s pretty well established in the industry now that making rules available as PDFs does not hurt the sales of a game – in fact, the opposite.